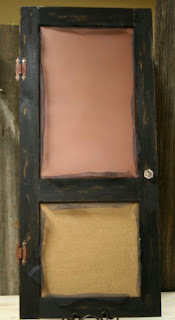 Well, yet another idea of ours...this is a remake of an old screen door with one of our copper magnet boards and cork board on bottom. Just perfect for the area beside fridge to keep pictures and memos in order. This is sooo cute in person...pics do not give it justice. Can be personalized with your last name on board and last name intial on magnet board. Also, these are custom ordered for the size you need. Hi! I love your frames and signs!! I would love to order something but I'm just not sure what yet. I know I want the pink plaque frame a few posts down that says "I love you to the moon and back" and maybe a name sign. I'm going to look around a little more at your products first to be sure of what I want. Do you do custom quotes on signs? I guess I should have emailed all of this to you! :) My email is desperk@bellsouth.net. love the message center!! cute cute! i need that!